Thank you so much for visiting my blog! My name is Harper Lee, and I’m a Golden Retriever sharing my reflections on dogs I like, people I like, places I like, and things I like. After spending my first six years of life in Baton Rouge, Louisiana, I moved with with my humans to New Orleans in April 2015. I’m loving life in the Big Easy. I was born in a little town just outside of Baton Rouge on March 17, 2009. My human mommy and daddy had no intentions of adding a puppy to their family. My late canine sister Lexi was still alive then, and she was more than enough. But, what can I say? It was love at first sight, and I had a new home. When I was a little less than a year old, my humans discovered that I have hip and elbow dysplasia. Fortunately for us, we live near the Louisiana State University School of Veterinary Medicine, and I have been doing physical therapy there ever since. I am happy to report that I am doing well. I love traveling with my humans. We’ve spent long weekends in New Orleans (before we moved there) and St. Francisville, Louisiana, and I like to visit my human grandparents in Texas. 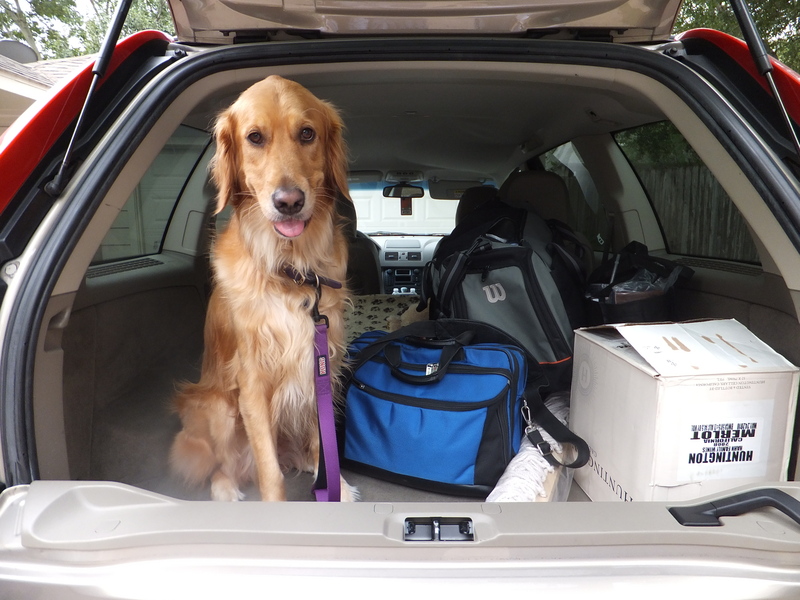 I even did a road trip to Florida to frolic on the beach with eight other Golden retrievers. I also like to go out to dinner with my humans. 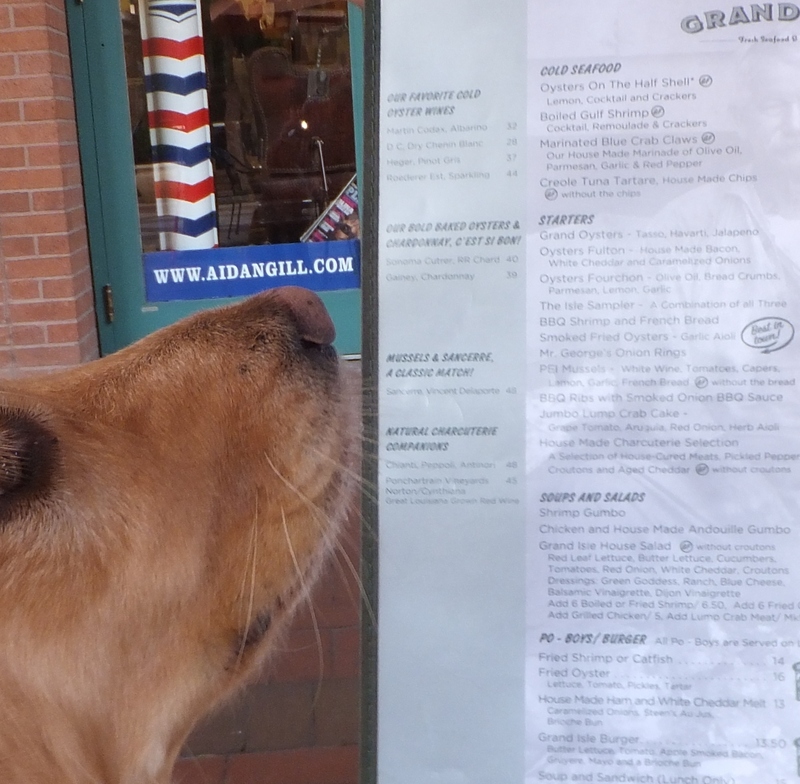 You’d be surprised how many restaurants with outdoor seating welcome dogs. 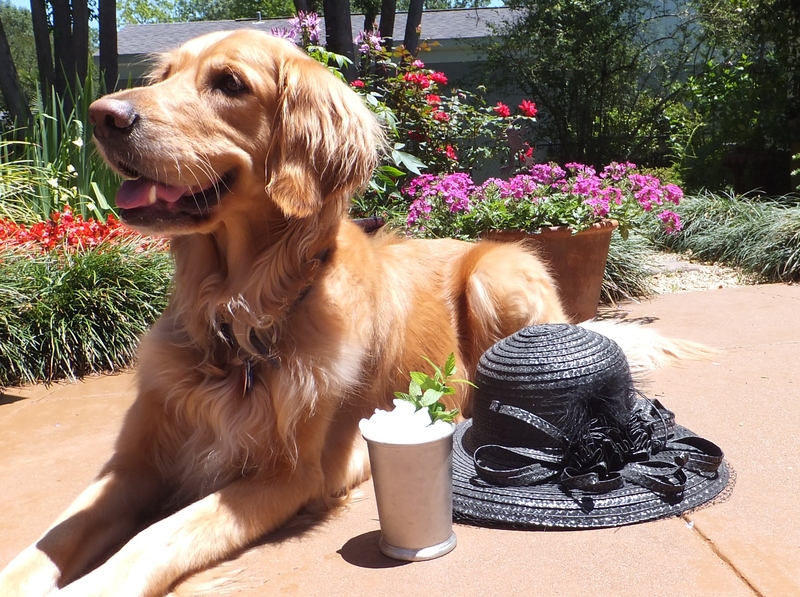 Some even have special menus just for their four-legged guests. In June 2015, I welcomed my little sister, Tallulah Bee, into our family. She’s a handful, but I love her more and more every day . . . maybe that’s because she’s more and more mature and easier to live with every day. 😉 She makes occasional appearances in my blog, but I’m still the boss. I hope that you’ll stop by again, and I’d be thrilled if you decided to follow my blog. You can also follow me on Instagram (@thek9harperlee) or Twitter (@thek9harperlee). I even have my own email address (misslee@thek9harperlee.com), so I hope you’ll send me a little note. Have a great day! Harper Lee I believe you may have inspired the Disney’s Channel Dog With a Blog television series. Do you know the star of the show, Stan? I wish I knew Stan–he is quite handsome–but alas I have not had the pleasure of meeting him. While I do like to see myself as inspirational, I think his show was on the air long before I hit the blog scene. By the way, I like to watch television, but I’ve never seen Dog with a Blog. Will have to add that one to my viewing calendar. Hello my old friend Harper Lee, I have missed you these past few weeks. I have had a terrible loss in my family, my mommy went to heaven and I had to be adopted, my new mommy has to other furry children that were adopted as well. :) My new house is big and has a big yard with lots of squirrels! I like to play outside with my new sisters and go for walks when it is not raining! Rain Rain Go away!!!! I am thrilled to to hear about your new home, Miss Abby. You are a very lucky girl, and I know that you are excited about the new squirrel-chasing opportunities. Hope to see you soon . . . well, as soon as this yucky rain goes away! remorse for her rambunctious child. Thank you so much for the kind comments, Miss Boots, and for your memories of Sunshine and Maggie. They are two of my very most special friends! Happy Birthday Miss Harper Lee, today I nominated you for the Versatile Blogger Award. Thank you so much for finding my blog and following! You have a beautiful blog, and we have a connection: my human daddy’s family on his mother’s side is from Norway. My humans hope to visit one day very soon. Hello to Franco! Note from Miss Harper Lee: I was doing a little blog housekeeping and realized that I put this reply to you from earlier this month in the wrong place. My sincerest doggy apologies. I must have had squirrels on the brain! Hi Miss Sheila–My mommy is severely technically challenged, so she just did a cut-and-paste on the We Are Family badge. Hope that helps, and thank you so much for the compliment on my Derby hat. One of my horses came in second, so I was pretty excited! Thank you very much, Ku’s mama! And what a special and well-deserved award day for you. Congratulations! Thank you and congrats to you Sweet Miss Harper Lee! Ku has told me all about you (I think he has a crush on you) 😉 and he says you should pick the Super Sweet Blogging Award. But I think you shine like the sun, so maybe the Sunshine Award? Looking forward to checking out some new blogs. Congratulations to you and your nominees. What a fun group! Thank you so much for visiting and for your kind comment. I also hope that you start a blog for your dog, who is very, very cute! Thank you so much! I have her doing some maintenance in my garden this morning 😉 but as soon as she finishes that, I’ll join her at the computer to read it. Thank you! It’s entitled: “By Request, 10 Ways to Heal a Broken Friendship.” (I don’t like to put links to my blog in other people’s blogs, if I had your email I’d send the link that way). You made my heart melt, Wiley. Thanks for the love! I’ve nominated you for a ‘Blog of the Year 2013’ Award- many congratulations! Hi Tess–I’m so happy that you found me, too, and so sorry for the long-delayed response. I’m also happy that you enjoy seeing the world through my eyes. Some days, it’s the only way to go! 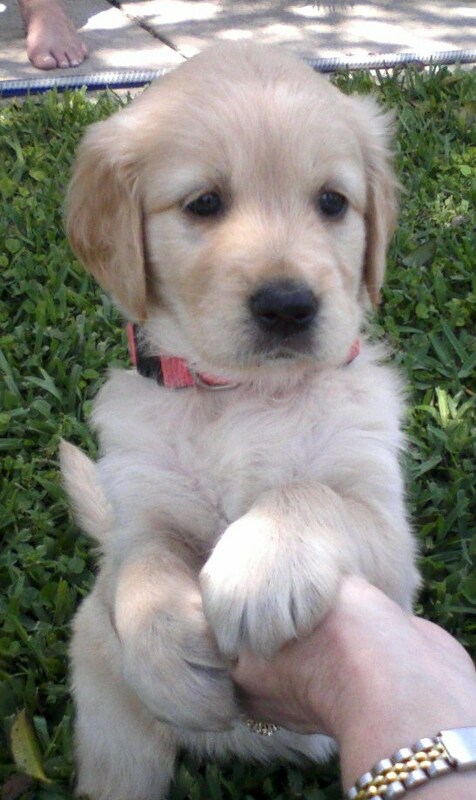 Miss Harper Lee – you were such a cute puppy. No wonder it was Love @ 1st Sight. I like your About Me page. I learned so much aboutz you. Such a cute puppy photo! Nice re-vamp of the page! Good page. We’ve learned new things about you, Miss HL. Physical therapy looks like fun. When Mom got a new knee and went to physical therapy, it didn’t seem like fun at all. Go figure. 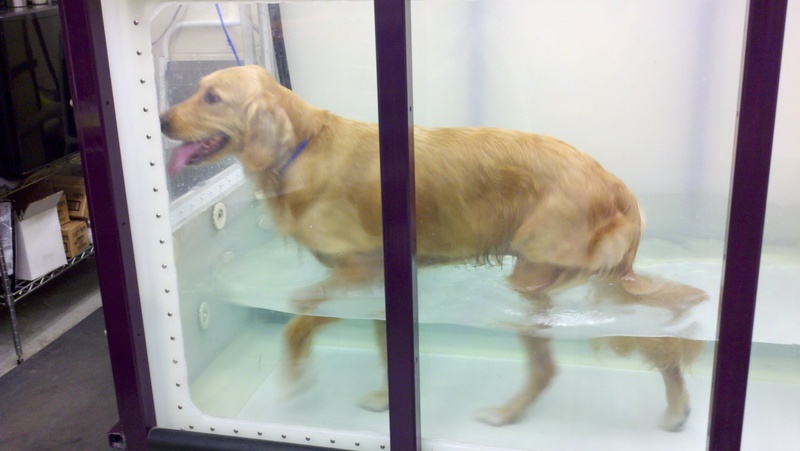 I think puppy physical therapy definitely is more fun than human physical therapy . 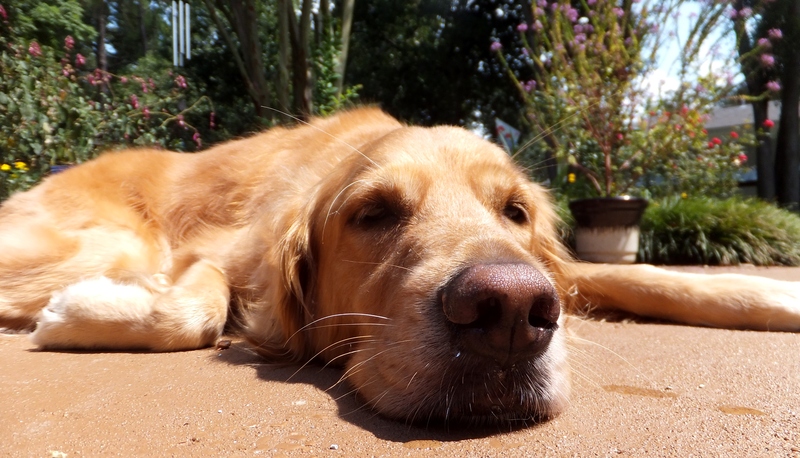 . . but then again, isn’t everything better when you’re a dog? Thank you so much! So happy to have “met” you, and I’m enjoying your blog! Best blog I’ve ever seen. Really amazed me about your story Haper Lee. You’re in Baton Rouge! Way cool! My sister lives there and I’ll be hanging out with her the last week of October. We should do lunch! I’ll bring the dog treats! I just had my human mommy/blogging assistant send you an email. Hope all of our schedules work out so we can get together! Harper Lee – I live outside of Chicago and I am putting together a flyer about local events here in the Spring. One of the events is a Doggy Egg Hunt and I would like to have your human’s permission to use the picture of you celebrating Easter. Can you ask if that’s ok? Of course. I only ask that you credit the blog–thek9harperlee.wordpress.com–and thank you so very much! so nice to meet you (finally) at the dog parade! i got a cute pic and posted it to our marsh dog fb page. it reminded me of the nice pic you sent a while back of harper trying our biscuits. sadly, i couldn’t find that on the blog. can you please direct me? would like to repost! thanks and love to harper lee! You are so sweet! I actually didn’t realize until I read this comment that you hadn’t met Harper Lee in real life before Sunday’s parade. We’ve actually done two posts on Marsh Dog. I’ll include the links here and also send you an email with the links. I love all the art you have been pictured with, as I am a high school art teacher in Norman, Oklahoma who also has a golden! Thanks for such an adorable blog! I enjoy your blog posts! Please keep it up. And thanks for following my blog (https://rhudginsadventrues.wordpress.com/). OMG Harper and Tallulah are so gorgeous! 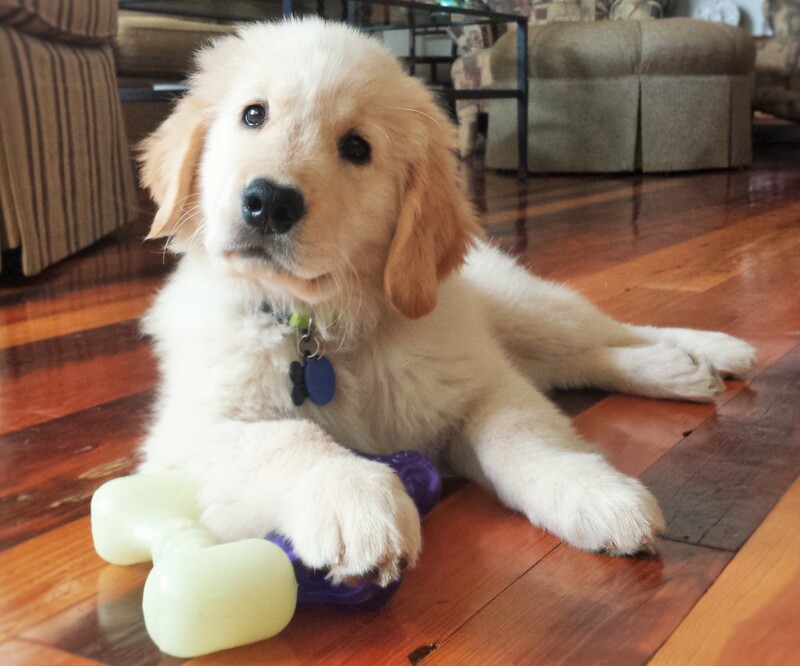 I just started pet blogging about my puppy! Even though I just got my pup, I’m excited to get her a friend/sibling because of how adorable Harper and Tallulah are! That’s so sweet. Sending you an email now. Take care out their in The Big Easy!